However, No Additional Appellate Sanctions Imposed. In Horner v. Judges’ Retirement System, Case No. C084619 (3d Dist. Jan. 25, 2019) (unpublished), the Third District affirmed a $17,820 sanctions award imposed under CCP § 128.7, observing in the process that no showing of bad faith (only legal frivolousness) is necessary under this sanctions statute versus the bad faith showing required under § 128.5. However, it refused to impose additional appellate sanctions, based on this reasoning: “The easy case is where there is evidence the appeal was filed for an improper motive. The more difficult case is to distinguish misguided lawyering from an egregious misuse of the appellate process because we certainly do not want to punish a lawyer for full-throated advocacy on behalf of his or her client by raising a novel theory or nudging the development of the law” (Slip Opn. at p. 7), with there being enough advocacy to justify the result. “Safe Harbor” Argument Might Have Worked, But It Was Waived Because Only Raised In Appellant’s Reply Brief. Hanna v. City of Long Beach, Case No. B281878 (2d Dist., Div. 3 Dec. 17, 2018) (unpublished) shows how good arguments can be lost if not timely raised. In this one, City and its counsel were jointly sanctioned $12,000 for unsuccessfully attempting to disqualify plaintiff’s counsel on the eve of trial. The appellate court found this award was no abuse of discretion. However, in its reply brief, City raised the argument that no “safe harbor” period had been afforded under CCP § 128.7 in line with the Second District’s Nutrition Distribution opinion [No. 19 on our 2018 Top 25 Decisions]. This might have been a winner, but City did not raise the contention until filing its appellant’s reply brief. Too late—the argument was waived! Panel Disagrees With Prior 4/1 Panel In San Diegans for Open Government And Follows Contrary Result Reached By 2/7 DCA In Nutrition Distribution. We find the result in CPF Vaseo Associates, LLC v. Gray, Case No. D072909 (4th Dist., Div. 1 Dec. 6, 2018) (published) both refreshing and correct in its reasoning. It goes to show you that appellate courts, even within different panels in a particular division, are willing to disagree among themselves. In this one, a 4/1 DCA panel decided that CCP § 128.5 moving parties must satisfy the 21-day “safe harbor” requirement of CCP § 128.7 in order to be procedurally entitled to sanctions—providing the opposing party an opportunity to withdraw the challenged conduct. This panel decided that a different 4/1 DCA panel’s decision to the contrary in San Diegans for Open Government v. City of San Diego, 247 Cal.App.4th 1306 [reviewed in our June 9, 2016 post] was not the right result, siding instead with the reasoning by the 2/7 DCA in Nutrition Distribution, LLC v. Southern SARMS, Inc., 20 Cal.App.5th 117, 130 [reviewed in our Feb. 3, 2018 post]. BLOG OBSERVATION—Co-contributor Mike made this argument before a Los Angeles County Superior Court judge, who did not accept it because only San Diegans was published at the time. Likely, this decision may make unnecessary California Supreme Court review given that there is now an intermediate appellate court “plurality” requiring compliance with the “safe harbor” requirements. Result Was Defendant Had 25 Days After Remittitur To Pay Fee/Costs Vacate Award, With Dissenting Justice Believing That The Fees/Costs Award Should Be Reduced Down By Another $17,250. This next case, F&S Investment Properties v. Nguyen-Stevenson, Case Nos. B281031/B281973 (2d Dist., Div. 1 Oct. 9, 2018) (unpublished), is a 2-1 decision regarding stay appealability issues and how much discretion attends a lower court’s decision to condition a vacate of a default judgment based on payment of $27,968.75 in attorney’s fees and costs. Plaintiff obtained a default judgment against defendant, who moved to set aside under CCP § 473.5 (a section allowing this be done but with fee and cost shifting as the trial judge deems just and proper). The trial court granted the vacate of the default judgment on condition that defendant serve an answer and pay $27,968.75 in fees and costs. Defendant did not pay and appealed this order; later, the trial court ordered the vacate default and reinstatement of the default judgment, a second order appealed from by defendant. The 2/1 DCA majority agreed that the first order was appealable and that it was ambiguous—it either said the judgment will be set aside upon payment or was set aside no matter what, such that is was appealable. However, the majority decided that the conditional payment order was no abuse of discretion but that the lower court had no jurisdiction to make the second order given that the first order was not one for payment of money per se such that it was stayed on appeal. The result was that the plaintiff had to pay the money 25 days after the remittitur issuance or else the default judgment would be reinstated. In dissent, Justice Johnson found the $27,968.75 amount was an abuse of discretion because there was no proper allocation of fees and costs for work to actually get the default judgment vacated; he would have reduced the amount of $17,250 at a minimum. Report Also Shows That Reporting Attorneys Did Not Provide The “End Conclusions” To The Sanctions Requests. When one boils down both the Bureau and Judicial Council statistics, less than one-half of 1% of civil cases filings involved 128.5 requests (singular or combined with 128.7 requests). Two Separate Sanctions Below $5,000 Cannot Be Aggregated For Appealability Purposes. The appellate court dismissed the appeal. The reason? A party cannot aggregate monetary sanctions for purposes of appealability purposes, fully endorsing the reasoning to the same effect in Calhoun v. Vallejo City Unified School Dist., 20 Cal.App.4th 39, 44-45 (1993) [1st Dist., Div. 5]), but indicating this did not foreclose an extraordinary writ petition if a true wrong was done through a sanctions order below. However, Sanctions Order Relating To Discovery Order Reversed As A Matter Of Law Based On Evolving, Unsettled Area Of The Law. In Yelp Inc. v. Superior Court, Case Nos. G054358/G054422 (4th Dist., Div. 3 Nov. 13, 2017) (published), plaintiffs successfully obtained a discovery order against Yelp compelling it to disclose documents that might reveal the identity of an anonymous reviewer allegedly making slanderous statements (with plaintiffs proving a prima facie case of slander). The lower court also imposed $4,962.59 in discovery monetary sanctions against Yelp. Although losing a standing argument, plaintiffs did obtain affirmance of the discovery order. However, with respect to the sanctions order, the 4/3 DCA—in a 3-0 opinion authored by Presiding Justice O’Leary—reversed as a matter of the law given that this area of the law was evolving and unsettled such that Yelp’s challenge of the discovery order was substantially justified. BLOG OBSERVATION—We noticed that Steve Krongold, who both contributors know, won the merits on behalf of plaintiffs. Congratulation, Steve. Continuing Jurisdiction And Waiver Principles Justified Sanctions Order. Old Jail Whipping Post. St. Augustine, Florida. John Margolies, photographer. Library of Congress. Windsor Mango Way LLC v. Taylor, Case No. B268967 (2d Dist., Div. 3 Sept. 28, 2017) (unpublished) is a case where an attorney was sanctioned under CCP § 128.7 for conduct relating to a case which had been ordered to arbitration. Attorney challenged the order primarily on the theory that the trial court lacked jurisdiction to issue sanctions given the case had been ordered to arbitration. Not so, said the Court of Appeal in affirming the sanctions order. Two reasons sealed this conclusion. First, because the sanctions ordered related to activities after a motion to compel was granted, the trial court had “vestigial jurisdiction” to order sanctions and an erroneous order did not give rise to CCP § 473 relief. Second, waiver principles precluded attorney’s efforts to vacate the sanctions order because attorney himself invoked the jurisdiction of the trial court when he moved for sanctions against the other party on his client’s own behalf. In this one, a trustee lost certain trust challenges by other relatives, also saddled with a costs/fees award of $440,000. This award was affirmed because the lower court decided that it should be paid out of the entire trust res, so that the successful parties had to bear some of the fees because of a common fund wrinkle in the case making it fair to spread the fee award over the res rather than simply paid out of losing trustee’s res share. Leino v. Balkcom, Case No. C080950 (3d Dist. Aug. 9, 2017) (unpublished). The second decision was a situation where a trial judge granted CCP § 128.7 sanctions against a trustee and attorney, who challenged on many, many grounds. None held up on appeal. The interesting aspect of this opinion is the appellate court’s conclusion that trustee’s failure to remove a lis pendens after the probate action was dismissed for over a year justified imposition of sanctions. The sanctioned parties argued that the recording of a lis pendens did not justify imposition of sanctions, but the appellate court disagreed based on the fact that a lis pendens needs to be procedurally filed with the court so to trigger section 128.7. The probate court in In re Patrice Libaw Trust, Case No. B271815 (2d Dist., Div. 1 Aug. 3, 2017) (unpublished) awarded CCP § 128.7 sanctions against only a probate litigant’s attorneys, not the probate litigant (although sanctions were requested against both). Litigant appealed the sanctions award against attorneys, but the appellate court determined it lacked jurisdiction because client alone did not have standing to appeal an adverse award against her attorneys. The result would have been different had both client and attorneys been assessed with sanctions; however, this did not happen, so no appellate jurisdiction. Dissenting Circuit Judge Would Have Affirmed Based On Waiver. On April 23, 2017, we posted on the U.S. Supreme Court’s decision in Goodyear Tire & Rubber Co. v. Haeger, 137 S. Ct. 1178 (2017), which found that a $2.7 million “inherent power of the court” sanctions award needed a restudy based on the correct “but for” causation standard albeit indicating that a waiver issue needed upfront adjudication. The Ninth Circuit, in Haeger v. Goodyear Tire & Rubber Co., No. 12-17718 (9th Cir. June 8, 2017) (published), ruled through a 2-0 majority decision that the district court should revisit the sanctions issue. Circuit Judge Milan D. Smith, Jr., in dissent, found that Goodyear had admitted that only $722,406.52 of the sanctions award was tainted, such that the remaining $2 million award should simply be affirmed rather than involve any further scrutiny by the district court. Abuse Of Discretion Standard Not Overcome By Appealing Ex-Wife. Marriage of Gregora and Feldman, Case No. B269587 (2d Dist., Div. 8 May 8, 2017) (unpublished) was a high profile divorce case involving Los Angeles attorneys, where ex-wife lost a key breach of fiduciary claim, prompting the trial court to impose a sanction against her to the tune of $250,000 under Family Code section 271 (the sanctions was an award of partial attorney’s fees incurred by ex-husband). Ex-wife appealed, but to no avail. The appellate court observed that the sanctions award was no abuse of discretion given that (1) ex-wife issued 450 subpoenas on third parties yielding over 100,000 pages of documents; (2) she deposed ex-husband’s ex-wife, several partners in his firm, and numerous accountants; (3) ex-wife spent $3.6 million on the case and ex-husband spent $2.1 million; and (3) ex-wife lost on the breach of fiduciary claim. $2.7 Million Sanctions Against Goodyear Reversed And Remanded, But Waiver Issue Might Sustain $2 Million Of Sanctions Award. 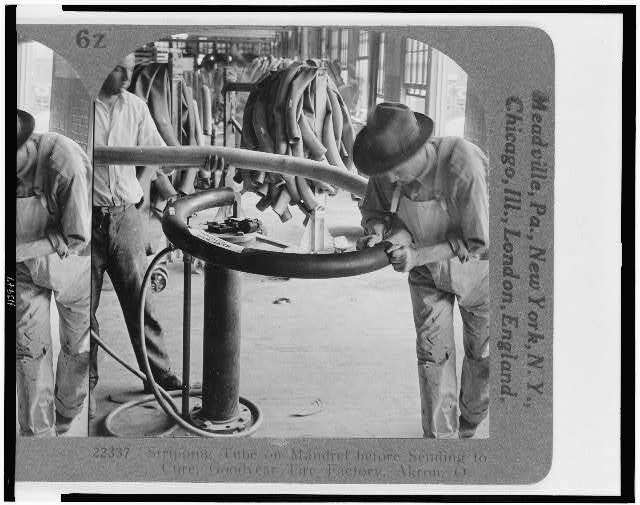 Stripping tube on mandrel before sending to cure, Goodyear Tire Factory, Akron, Ohio. c1928. Library of Congress. The U.S. Supreme Court, in Goodyear Tire & Rubber Co. v. Haeger, No. 15-1406 (SCOTUS April 18, 2017), clarified the standard to be used by district judges in imposing “inherent power of the court to control judicial process” sanctions as far as setting an appropriate amount of sanctions, reversing a $2.7 million sanctions award in favor of plaintiff and against defendant Goodyear after a case was settled. Determining that both the district judge and Ninth Circuit used the wrong standard, SCOTUS—in a decision authored by Justice Kagan—articulated that a “but-for” test was appropriate, where the award must have a causal connection between the sanctioned litigant’s misbehavior and the legal fees by the opposing party seeking the sanction. The district judge did not use a “but-for” standard, and the Ninth Circuit erroneously used a temporal, rather than causal, limitation by sustaining a $2.7 million award for all legal fees incurred by plaintiff since the date of the misconduct. Interestingly enough, the district judge made a $2 million “contingent” award based on some causation analysis, but SCOTUS was still concerned that it was not quite right. However, Goodyear may have admitted that the $2 million award was causally related, setting up a waiver issue that SCOTUS observed “should be the initial order of business below” upon a remand. Scotusblog analysis is available by clicking here. Appeal By Attorney's Client Did Not Get It Done. In K.J. v. Los Angeles Unified School District, Case No. B269864 (2d Dist., Div. 3 Feb. 23, 2017) (unpublished), a minor's attorney was ordered to pay attorney's fees and costs to LAUSD as a discovery sanctions. Minor appealed from the sanctions order. "Double Dipping" Was The Rationale. Earl & Reimer APC v. Klimek, Case No. H041638 (6th Dist. Feb. 1, 2017) (unpublished) is a case where an attorney's fees award was reversed and remanded in order to prevent "double dipping": the trial judge previously awarded discovery sanctions, and those sanctions were not properly taken into account with respect to the fee recovery calculations. 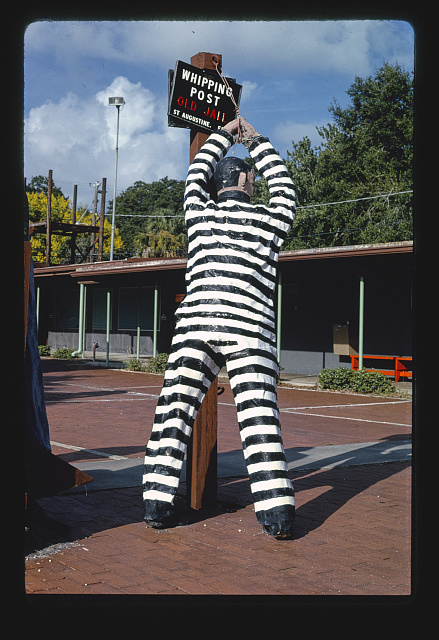 Reversed and remanded for a "re-do." Click here to see the famous "double dip" episode in Seinfeld. In The News/Sanctions: Throwing A Cup Of Coffee At A “Heated” Deposition – What Does That Cup Cost You? Answer: Roast Costs $250 In A Recent California Federal Magistrate's Ruling. Pike Place Market, cup detail on sign. Seattle, Washington. Photographer: Carol M. Highsmith. Between 1980 and 2006. Library of Congress. As reported by Law360, an attorney who spilled — or perhaps threw — a cup of iced coffee on an opposing lawyer during a deposition must pay him $250 to cover his damages, according to U.S. Magistrate Judge Donna M. Ryu (N.D. Cal.) who apparently on January 26, 2017 scolded both attorneys for their behavior in a contentious trade secrets case. Hope the coffee was not a good latte! Somewhat Of A Pyrrhic Victory For Plaintiff. Wilson v. Nationstar Mortgage LLC, Case No. D070965 (4th Dist., Div. 1 Jan. 20, 2017) (unpublished) was somewhat of a pyrrhic victor for plaintiff on appeal. What happened below was that a trial judge erroneously failed to honor plaintiff's dismissal of an action, striking it and then going forward to award discovery sanctions and attorney's fees against plaintiff and in favor of the defendant. The appellate court agreed with appellant Wilson that the trial judge lacked jurisdiction to strike and dishonor the dismissal, but critically found the lower court retained jurisdiction to enter discovery sanctions and attorney's fees (the latter, subject to any Santisas limitations) post-dismissal anyway. So, those sanctions and fees award stuck on appeal. Reason Is That Ground For Sanctions Was Statute Only Applying To Postjudgment Interrogatories And Document Requests, Not J/D Exams. A lower court sanctioned a judgment debtor’s attorney to the tune of $5,000 under CCP § 2023.030 for directing a client not to answer certain questions at a judgment debtor examination. The appellate court, in Smith Bros. Constr. v. T.S. Stone and Title, Inc., Case No. D069212 (4th Dist., Div. 1 Dec. 9, 2016) (unpublished), reversed. The reason was simple enough: section 2023.030 does not apply to judgment debtor exams, but only postjudgment interrogatory and document request items. The wrong ground for the sanction was raised, a ground not allowing for imposition of sanctions. $10,000 Out Of $28,080 Sanctions Request Granted. In Concepcion Vinas v. Queen of the Valley Medical Center, Case No. A143541 (1st Dist., Div. 4 Oct. 20, 2016) (unpublished), attorney was sanctioned $10,000 under CCP § 128.7 for filing a second amended complaint which had the same allegations as a first amended complaint to which a demurrer had been sustained in many ways with prejudice. His appeal was unsuccessful. Filing an improper complaint can give rise to 128.7 sanctions. (Eichenbaum v. Alon, 106 Cal.App.4th 967, 971-972 (2003).) The amount was not unreasonable, given that only $10,000 out of a requested $28,080 in sanctions was imposed by the lower court. Lower Court Lacked Jurisdiction To Consider Motion Post-Dismissal. Timing is everything, as illustrated in the sanctions area by Cerna v. Molina, Case No. B265272 (2d Dist., Div. 7 Oct. 17, 2016) (unpublished). There, defendants and their attorney were monetarily sanctioned in connection with certain discovery motions. Plaintiff voluntarily dismissed the action. However, defendants and their attorney moved to vacate the trial court’s orders imposing sanctions. The lower court denied the motions to vacate, a determination affirmed by the 2/7 DCA. The reason was very fundamental: the trial court lost jurisdiction to act on the case following the voluntary dismissal. There was nothing else to do. Certiorari Granted With Consolidated Case On September 29, 2016. On September 29, 2016, the United States Supreme Court granted certiorari in The Goodyear Tire & Rubber Co. v. Haeger, No. 15-1406 (U.S.), a Ninth Circuit 2-1 decision [discussed in our July 21, 2015 post], and consolidated it with Musnuff v. Haeger, No. 15-1491 (U.S.). The Ninth Circuit decision, over a dissent by Circuit Judge Watford, affirmed a $2.7 million sanction award granted under the “inherent authority of the court” without requiring a causal connection between the sanctioned conduct and civil monetary sanction imposed. The Ninth Circuit majority decided that no precise linkage was required between the harm and compensatory sanctions awarded where the sanctionable conduct was frequent and severe. Here is the issue presented for review in this case: Whether a federal court is required to tailor compensatory civil sanctions imposed under inherent powers to harm directly caused by sanctionable misconduct when the court does not afford sanctioned parties the protections of criminal due process. First Half Of 2016 Saw A Large Decline. Gibson Dunn has published a mid-year 2016 review of electronically stored information (ESI) decisions in federal courts involving requests for sanctions. There has been a large decline. In the first half of 2016, there were only 32 reported decisions, 13 granting sanctions and 19 denying them for ESI violations. This compares to 150 reported decisions in 2011 and 120 in 2012 (federal courts). The authors of the review believe that some of the decline is related to the federal rule amendments requiring both relevancy and proportionality. Some of the most volatile decisions involve how to deal with text messages and mobile data.